There will be several fireworks shows in the Portland area this Sunday, July 4th 2010. All of the shows listed below can be viewed from the sponsoring event venues, or the surrounding area – I suggest finding a tall building or hill (we watched fireworks all over town from our apartment building roof last year). Or consider TriMet’s nifty Independence Day guide if you want to get a bit closer. This is the big one; one of the largest fireworks displays west of the Mississippi River. Last year’s show was cancelled due to funding issues, but it’s back in 2010. The show starts about 10pm, and can be seen from miles around, on both sides of the Columbia. The fireworks show is the climax to a day of festivities at the fort – visit the website for more information, including admission prices and entertainment schedules. Starting at 10:05pm at Tom McCall Waterfront Park, this is the largest fireworks show in Oregon. Viewable from anyplace around town that has a nice view of downtown, this one’s the easiest to get to and from on TriMet. And of course if you’re attending the blues festival, you’ll have a great view. 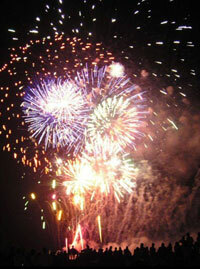 Also on the Willamette, the Oaks Park 4th of July Spectacular starts at 9:55pm. Viewable from parts of SE Portland and of course at the park, where if the weather’s nice, you might consider picnicking. Admission for July 4th is $5 ($3 for seniors 62 and up, and $2 for kids 15 and younger). Summertime at Oaks Park can be blissful. The Portland Beavers host the Las Vegas 51s at PGE Park Sunday, July 4th, and as per tradition there will be a post-game fireworks display. Watch from the bleachers, or from 18th Street, or plenty of other good viewing areas in SW and NW Portland. Portland Fireworks! from Andrew Curtis on Vimeo. The best way to see the Oaks Park fireworks is to sit on a curb on the bluff (Sellwood Blvd) drinking a beer as people in the neighborhood light off fireworks at dusk. After the Oaks Park fireworks, there’s a encore, front-yard performance a few houses away that will cap the evening and make you proud to be an American, Oregonian and Portlander. Follow the chanting crowds for the encore. I’m a total dork for fireworks. Not as much of a dork for parades. Huge Fireworks! Families know the 4th of July Fireworks at the Corbett Fun Festival is the best place to be! Pancake breakfast at 7-10 am, car cruise at 10:30 candy raining old fashion parade at 11am that starts in Springdale and ends at the event site at the Corbett Grade School & Jeff Lucas Memorial stadium. 16 different inflatables in the FunZone including waterslides, clowns, games, vendors and big music that kicks off at 1 pm with Justin Shandor as the very best Elvis, Stone in Love, Buddy Holly and Johnny Cash. Top it all of with the biggest community sponsored Fireworks in the Northwest… and one of the third largest in the Portland Metro area. Music, FunZone and Fireworks at for $7 with park $5 All day and evening fun!